I am a huge fan of white. If you’ve been with me a while here, you know that, right? And I love black and white. I love the classic simplicity there. Gold is the new black. I’ve you’ve been following me on social media, you’ll see that the ‘golden’ age of KBS has begun to unfold. It appears that since I got my HP LaserJet 1102w for Christmas, that I can’t stop making shiny things with the printer and my Minc. It’s pretty funny because on our way home from getting the printer at Best Buy, a commercial came on where two guys were talking about what they were getting their wives for Christmas. One tells the other he bought his wife a printer and his friend responds ‘Dude! You don’t buy your wife a printer for Christmas! That’s what you want. She doesn’t want that! Get her some jewelry from ____ .’ And I’m laughing at Dan saying ‘Yes I do want the printer!’ It gives me shiny stuff on demand and you can’t beat that. I love this printer! I bought it because Heidi Swapp said that’s the printer she had and it worked beautifully. I’d noticed in other comments that people had other laser printers that didn’t work as well. So I figured, why tempt the LaserJet gods? Just get the same one. I’d heard rumors of people getting it around $80. I saw it on Amazon for that–give or take–during the holiday season. I really wanted to buy it local though. Something about having a printer shipped from an unknown source unnerved me. So I began watching my local places that had an online presence. Then one day…Best Buy…had them on sale for 69.99. Bingo! I purchased it online to pick up in the store. The store prices were higher. So watch for that. Before I had the laser printer, I had my son make copies where he works. They use Hammermill Color Copy Digital Cover, 80lb weight. And I’ll tell you right now…I am a paper snob. I love good feeling paper. And this stuff is dreamy! I will neither confirm nor deny some fondling of the open stock at the paper store. It works beautifully with the printer+Minc combo! And I’m also loving it for stamping too. One thing to note. The printer is an older model. It’s been out a few years. On the box it said it didn’t even support my 10.8.5 Mac–which is three years old. And to be honest, I didn’t even look at the box. With most printers you can just get updated drivers online. No such luck with this one–at least for my Mac anyway. Lots of research and frustration led me to call HP for help. I am technically savvy, mind you, so not finding the answer was a bit frustrating. When I called HP, they had me go through the System Preferences/Print+Scan and add the printer there. Additionally, we went into the Utility for the printer which opened a window in Google (not online though) but one that produces a window to make changes so you can add it to WiFi. I never would have figured that out, not to mention I found no information telling me to do that. So now it’s all wireless and I’m in heaven! Ever since we upgraded to a Time Capsule for a router a couple years ago, I couldn’t get the old printer to print Wi-Fi…or at all, it seemed. So we’d just plug into my Epson 1400 Photo printer (had for years) and use it as needed. But now with my new LaserJet printer, I couldn’t be any happier. And yes, I do have a Minc addiction. I know it. I admit it whole heartedly and without shame. Combine it with my affinity for tags and all things white, and you get this. My plan is to add kraft reinforcements whenever I get them from Thatch+Thistle. You know, I thought I loved white, white+white, white+black….but you pop that into shiny gold? Ohhhhh my gosh! I can’t even express how much I love it! The camera…the little plus sign border…the tiny words…holy cow! And how fun will it be to give the shiny Thank You and To/From tags to friends? They will think you bought them. The only thing I don’t like about the gold? But I’m feelin’ the gold, baby! I am just as in love with the white and gold as you are! 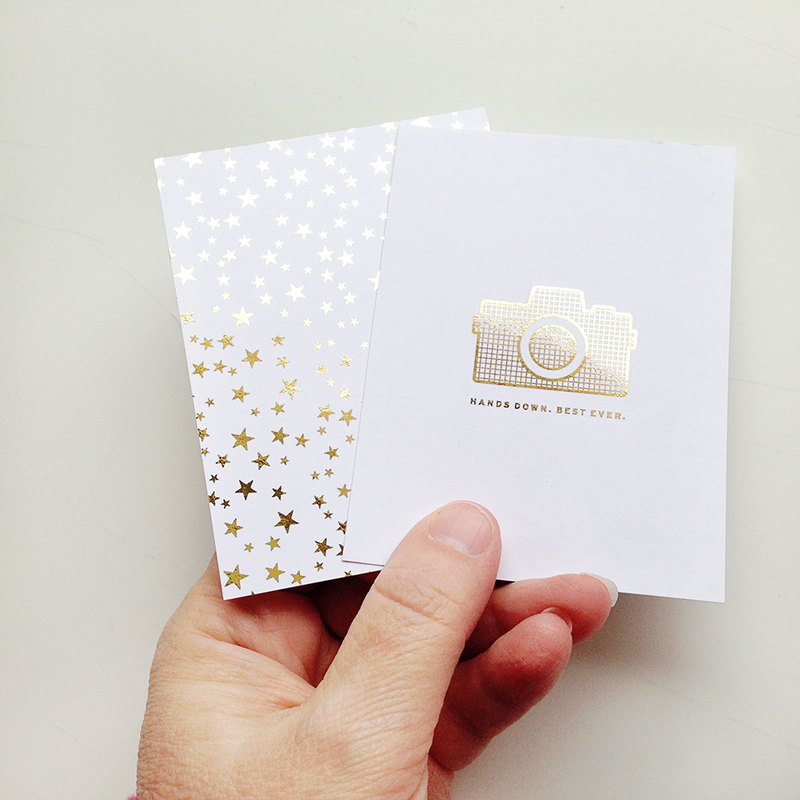 One thing we did around the holidays though, was use black cardstock with the gold in the Minc. Results were CLASSY. I’ve been looking for a laser printer for the Minc too. Can you feed the paper from the rear? I’m a little nervous of the driver issue. Not sure I would know how to connect it though. Um, not sure on feeding from the rear. I know it feeds from the front. I’ll have to go check on that ‘rear’ thing, but I don’t think there’s that alternative. As for the driver, I think if you contacted HP when you set it up, they would be able to help you. I kept my box in the event I had to return it. But alas, all worked out beautifully and it’s totally worth it. :) And I would say that if you can’t get it hooked up right away, don’t waste your time trying to figure it out, just call them. Oh, that 80lb cardstock goes through just beautifully. I haven’t tried American Crafts or Bazzill because I need the smooth for the Minc. I’d assume it would work. Do you have issues with the HP crashing when you go to print? I was looking at getting a brother since those are more compatible with macs. Currently I have an old hp (11yrs) and that is the issue I have. I know Heidi has a Mac, so I would think it worked well. This might be a dumb question, but how do you get gold ink from a printer? You use a machine called Minc to get the gold. It’s kind of like a laminator. But you print something that uses toner, like this LaserJet, and then you trim yourself a piece of the foil, lay it on top of the image and into the mat. Then run it through the Minc machine and voila! It’s all shiny and new…literally. :) Heidi Swapp has a whole line of stuff and it’s amazing! Thanks so much for this. 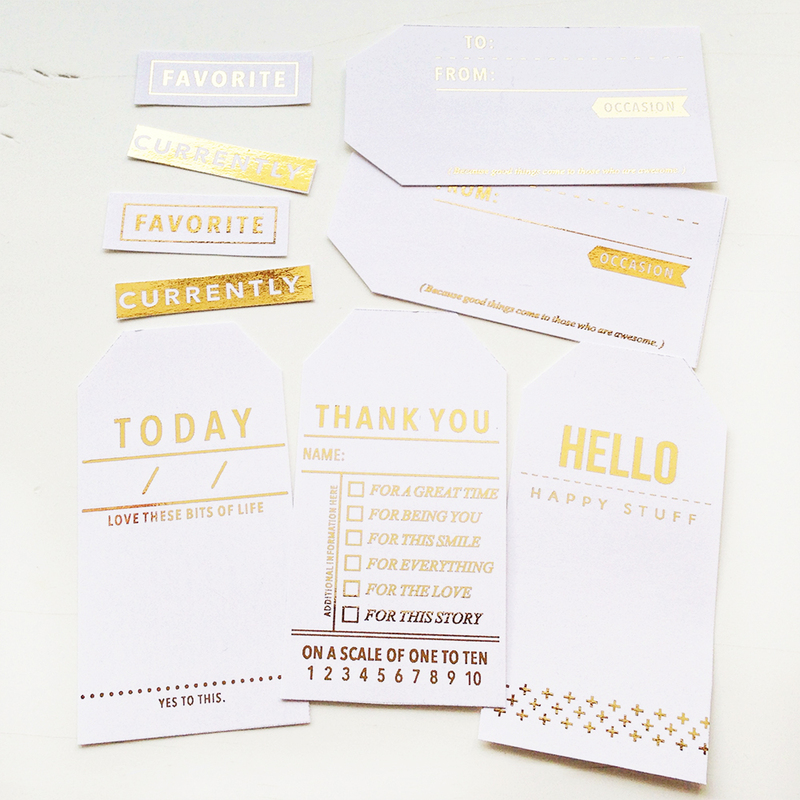 I’ve been dying to try foiling, but the need for a laser printer had me hesitating. I too have a 10.8.5 mac and I’m thrilled to know that this printer will work with both card stock and my computer. As you have to feed the paper from the front, does it curl much after going through the printer? It does have a little curl to it, but with a slight curl by hand the other way as well as putting it through the Minc, it’s pretty flat. OMG I asked for a laser printer for Christmas also – and got it!! And for the very same reason! Happy new year – hope it’s a glittery, shiny year for us both. I did all of my Christmas cards using my laser printer and the Minc. Everyone thought I had bought them! Hi Kerri! I am looking to get this same printer. As far as foiling with your stamps, do you stamp first, then scan it in on your printer to print it out so it has toner, or are you just using the digital stamps to print? Thanks! You can foil directly from the stamped image by using either a glue pad or sticky powder.